Years ago I worked with a client who was struggling with how to reinvigorate a holiday event that they’d been struggling with for years. They invested a substantial amount of time and effort into the event – and certainly weren’t stingy with their budget but their list of complaints continued year and after year. The space they were working limited them to 500 guests at rounds of 10 with little wiggle room and they were bored of the standard 3 course plated menu. It seemed that it wasn’t enough food for some guests and an inadequate variety for others. The food was late to some tables and cold for others. On top of this the bars couldn’t fit in the room with all the dinner tables so guests immediately high-tailed it to the lobby once dinner was over. The dilemma here is this client was spending a tremendous amount of money on décor, entertainment and lighting to make the ballroom beautiful, only to lose their guests the second the formalities ended. Over half headed to the lobby bars while the rest felt awkward in an emptying ballroom and simply left the event all together. Understandably the client was frustrated and desperately wanted to find a way to create a more fulfilling experience that would entice their guests to stay and enjoy the atmosphere long after dessert was served. This conversation was the catalyst to convincing this client to take the leap to something they had never tried before a stand-up reception. Admittedly, this can be a difficult change for many businesses who have grown to love the formality of a nice sit down dinner but more often than not my clients are seeing the benefits and freedoms that come with trying something new. In this case, the client made the leap and was thrilled with the outcome, even vowing never to return to a sit down reception again. So, is a stand up reception the right fit for you? I’ve talked a lot about the differences between stand up and sit down receptions in the past but today I want to discuss more specifically what you need to consider before making your own changes. The greatest advantage to a stand up reception is how well they facilitate networking. Open concepts allow far more freedom and your clients come together on these occasions ready to mingle! Instead of restricting guests to conversations with those next to you stand up receptions offer far more possibilities. Without the confines of standard tables the seating possibilities are endless – lounge style low seating, café tables, stand up cocktail tables and even communal tables can create a whole new atmosphere to enjoy. Placing food stations throughout the room also encourages more movement as guests have the freedom to mingle from area to area. The dining possibilities also expand when the space is opened up – and chef stations are one of my favourite options. What I love about them is the food is constantly being prepared, so it’s always hot and fresh! They also generally offer greater flexibility when ordering. Prices are typically based on an estimation so you’re not beholden to a specified plate count, making options like a pasta station both impressive and budget friendly. Passed options are also something you should keep in mind. Stations will always be a hit but when your guests get caught up in conversations they will be grateful for the passing trays so I generally never recommend omitting them entirely. So, how do incorporating options like these affect your meal planning? Well, if you are serving guests outside dinner hours 3-6 pieces per person is typically sufficient. During dinner hours, however, 8-12 pieces per person is likely more realistic. Ordering “per piece” also offer the benefit of greater flexibility and variety – Gluten free, vegetarian, dairy free options, your chef can come up with a station that ensures there is literally something for everyone! This brings us to the topic of timing. Believe it or not, it’s not uncommon for guests to completely forget to eat! The constant activity and mingling creates a fabulous atmosphere but it’s easy for everyone to get caught up in the excitement and miss the food entirely. The best strategy to ensure no one goes hungry is to stagger the opening of the stations as much as possible. 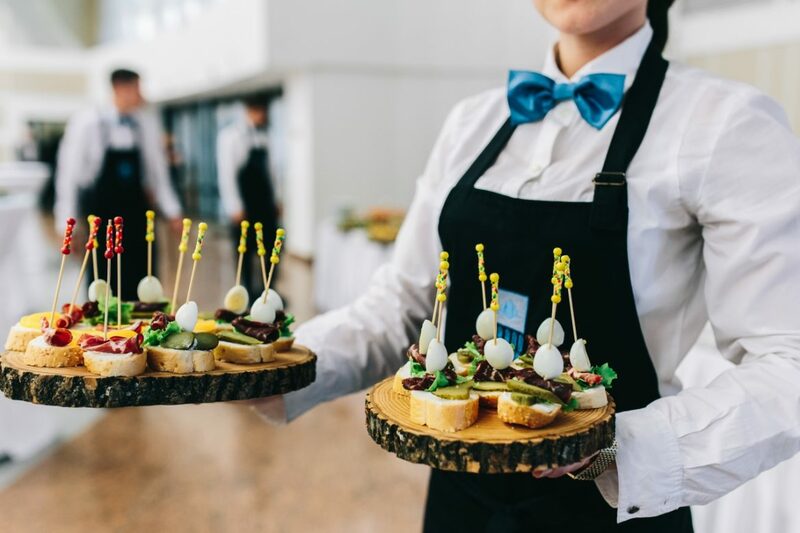 In Calgary many venues will only allow you to serve food for a maximum of 2 hours so in cases like this consider adding another small offering later in the evening like midnight pizza or a buffet of snacks, if the party is expected to continue into the night. These types of add-on are usually easy for venues to accommodate and a memorable and much appreciated offering for your guests. While it may seem like stand up receptions should be a more economical option, the truth is in most cases they’re not always the cheaper choice. Yes the portions are smaller – but keep in mind the kitchen is making more servings of a variety of hot, custom menu items. Staffing costs will almost definitely increase as well in order to accommodate more servers and bussing staff. From a décor standpoint, it tends to be more costly to bring in the options that will be needed to enhance the atmosphere without the standard round tables. What is important to remember is, while this may not be less expensive, it lends itself to achieving the objectives that most corporations are looking for when investing in a social event. Your guests will have a completely new and significantly more memorable experience – one with more freedom and choice, both, on what they consume and who they socialize with. At the end of the event I can guarantee that you will find you have happier attendees and a more successful event because of it. Need help with an Event in Calgary? Or do you need to get an estimate on planning your next event?